You can use the incline feature of your treadmill to get a better workout. Treadmills often have an incline feature to mimic walking and running uphill outdoors. A few also have a decline feature to simulate going downhill. By varying the incline, you can change the type of workout or add intervals of higher intensity. See the benefits and some sample workouts designed by trainer Lorra Garrick, CPT. Many treadmills will allow you to adjust the incline while you are using them, but some require you to make this adjustment before starting your workout. With those, you'll have to stop to change the incline and it won't be as easy to do an interval workout where the incline changes every few minutes. Check the treadmill before you start your workout to see how you can adjust the incline. You can get your heart rate up to a higher level at lower speeds, allowing you to exercise in your chosen intensity zone. Being able to go slower while achieving a moderate level of intensity is good for people recovering from an injury or who need less impact on their joints. Uphill incline recruits the postural muscles in new ways and stretches your calves and Achilles tendon. If you're new to inclines, your calves will probably tire and may even be sore the next day. You will also work your quadriceps more, which are the muscles at the front of your thighs, as well as giving a good workout for the glutes in your buttocks. Hill workouts give you variety and help you battle treadmill boredom. You will burn more calories per mile when walking uphill. The American College of Sports Medicine notes that for every 1 percent of grade, you increase your calories burned by about 12 percent. Warm up: Always warm up for five minutes with level walking or with only a slight incline, at a slower speed. Slow is Good: When you're climbing a hill, you will naturally go slower, but your heart rate and breathing will show that you are getting a higher exercise intensity than when at zero incline. Let those gauge your workout effort rather than the speed. Uphill Walking Technique: Use good posture and take shorter steps when you are using more incline. Lean only slightly forward and don't lean backward. Let go of the Handrails: You won't get as good of a workout if you hold onto the rails as you use incline. Use good uphill walking form at the speed where you can walk or run without using the handrails. Change One Thing at a Time: The intensity of your treadmill workout depends on duration, incline, and speed. If you are adding incline, keep the length of your workout and the speed you use either the same, shorter, or slower. As your tolerance for incline increases, then you can change the duration and speed. But if you change the incline, keep the other two the same. A steady-state hill workout aims to keep your heart rate at about the chosen level. You can do with a single setting or by varying your settings and speed. After your warmup, experiment with various speeds and inclines to find the setting that challenges you, yet is manageable enough to sustain for 30 minutes. Throughout the course of the session, do faster walks at low inclines, and very slow walks at higher inclines, for variety. Choose a pace and incline that brings your heart rate to 85 to 92 percent of your max heart rate. Use a heart rate chart to find this number or use a heart monitor or app. Slow or reduce the incline to an easy level for 2 minutes. Repeat for 3 to 4 repetitions. The shorter the interval, the tougher it should be. If you use a one-minute interval, you should be at the point you are only able to speak in short words by the end of the minute. Recovery intervals are easy enough to allow you to catch your breath and can last one to five minutes. 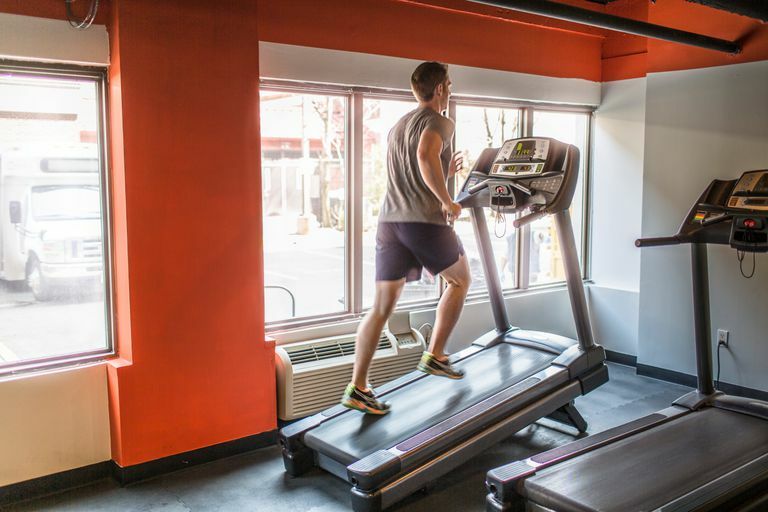 Some treadmills have interval programs, but they may not vary both the incline and the speed at the same time. Also, they may be limited in how different the incline is between intervals rather than allowing you to go to both extremes In this case, manual manipulation may be the best route. Repeat intervals three to 10 times depending on the length of your workout. End with a five-minute cool down.